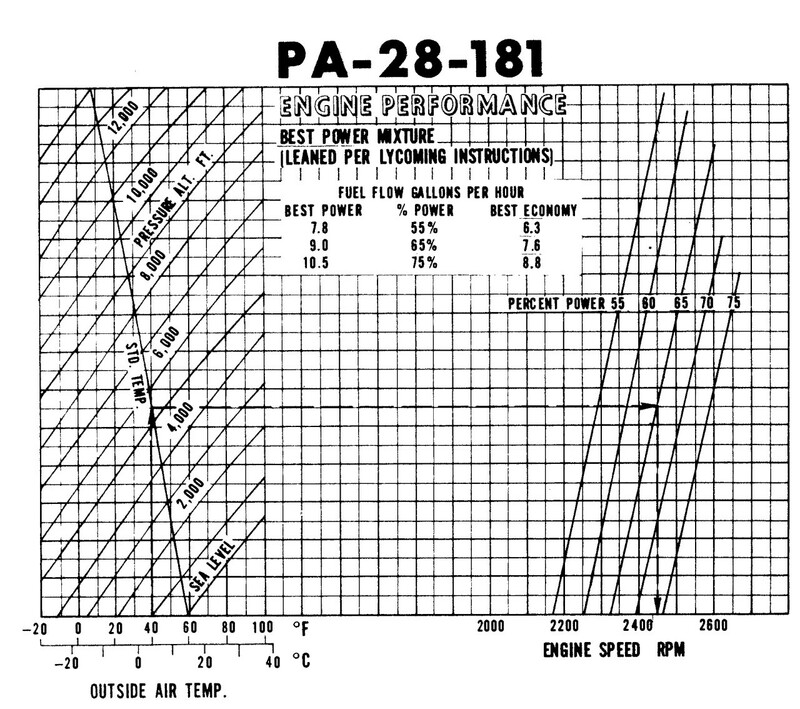 What is the throttle setting of a piston aircraft during cruise? I am learning to fly nowadays, I am sorry if this sounds like a dump question. What is the throttle setting of an aircraft during cruise flight? After stabilizing the flight after climb do i need to turn down the throttle? Broadly speaking its what ever you chose it to be. You should always refer to your aircrafts POH for the information specific to your airframe and engine. Beyond the POH there may also be supplemental engine information from the maker. Generally take off and at least initial climb out occur at full throttle. Then at when you reach your cruising altitude you will throttle back to your cruise power setting and level off. 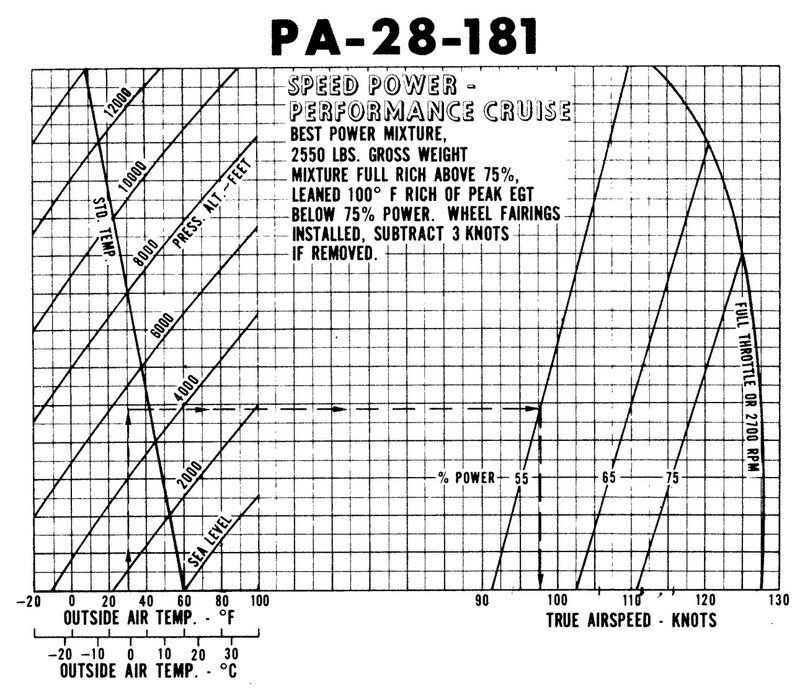 Then refer to this chart to see your airspeed. You can then use these numbers for your flight planing, or work backwards to achieve a target airspeed. For a trainer these numbers tend to be not all that large of a range. My Archer will do a full power climb out at 2650RPM then throttle back to about 2450RPM for cruise. Higher performance aircraft may have larger ranges as well as more complex operating limitations. Some engines have time limits on which they can be at full throttle and most have thermal operating limits if you decide to dance on the mixture lever. Turbo or super chargers may also add an additional level of management to prevent over boosting. Modern digital engine analyzers allow for a level of precision previously unachievable. AOPA has a decent article on power management over all, you can find it here. Pro Tip: A lot of small trainers print the engine performance data on the inside of the sun shade so you dont need to thumb through the POH in flight. It depends a lot on the particular aircraft, but generally power is reduced from full climb power to about 65% or 75% power at cruise. On a typical fixed pitch, piston powered training aircraft like a C152 or C172, you would reduce from full throttle to about 2300-2400 RPM when you level off at cruising altitude. Keep in mind that a typical piston powered aircraft only makes full rated takeoff power at sea level on a 15 degree C day. If you depart an airport at at 2000’ on a hot day, you already have less than full power. If you were to climb to 7,500’ with the throttle pushed all the way in, due to density altitude, you only have about 75% power being produced. Not the answer you're looking for? Browse other questions tagged flight-training piston-engine pilot-technique cruise throttle or ask your own question. Why do airliners pitch up during cruise? Book recommendations for learning how to fly? Is it harmful to operate an engine “over square”? Do any aircraft use throttle steering during normal flight? What flaps and throttle settings are used on takeoff, climb, cruise, descent, and landing?